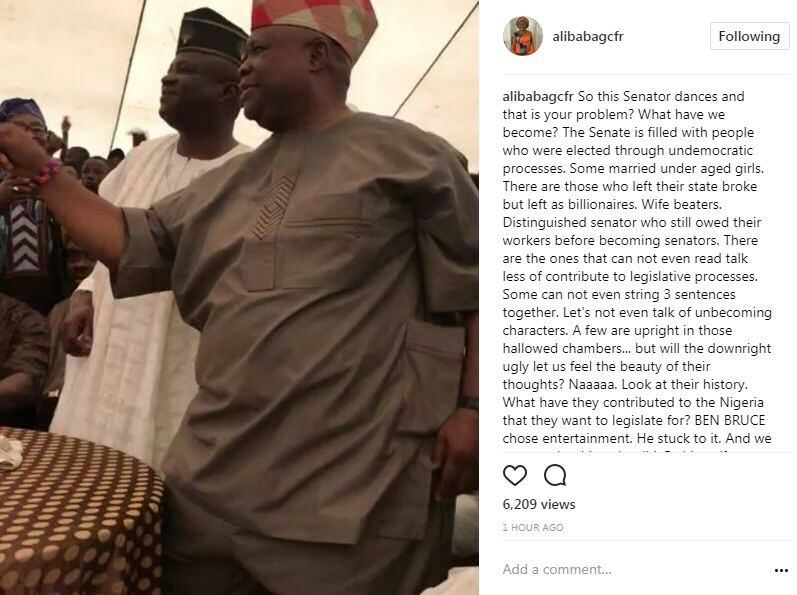 A viral video of Senator Ademola Adeleke dancing in celebration of his electoral victory emerged earlier today. 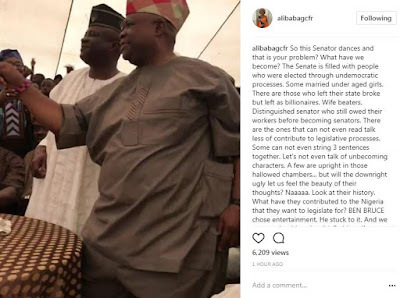 While some people like it, others are of the opinion that a Senator of the federal Republic of Nigeria shouldn't be seen dancing in such manner. So this Senator dances and that is your problem? What have we become? The Senate is filled with people who were elected through undemocratic processes. Some married under aged girls. There are those who left their state broke but left as billionaires. Wife beaters. Distinguished senator who still owed their workers before becoming senators. There are the ones that can not even read talk less of contribute to legislative processes. Some can not even string 3 sentences together. Let's not even talk of unbecoming characters. A few are upright in those hallowed chambers... but will the downright ugly let us feel the beauty of their thoughts? Naaaaa. Look at their history. What have they contributed to the Nigeria that they want to legislate for? BEN BRUCE chose entertainment. He stuck to it. And we can see the things he did. By himself. Mention others who are comparable to those ideals of "elected because of contributions to the growth of Nigeria?" FORMER GOVERNOR, is no contribution. You used state money. And we are fixated on someone's dance steps? I would rather he danced. At least I can see it as his weakness. What of the thieves that enrich themselves with public funds? Oh it's not a dance. A dance is sooooooooo grave. How dare he dance. But it's ok if he has strings of girlfriends that are brought to his private party regularly? What has his dancing got to do with the laws he would make? I would rather one Senator that dances than one that threatens to sleep with people's wives! Or a senator who can not sing the National Anthem! Or has more money than his working life can justify! Or one that knows teachers and pensioners have not been paid for over 6 months but collects his allowances and his salary unfailingly every 23rd of the month... plus community development allowance for projects we don't see. This is how I see it, he can dance all he wants, as long as he is a Senator in that hallowed chambers. That's all. So please... let him dance.